I perform classical guitar, flamenco guitar, and Brazilian guitar music (samba, bossa-nova, etc...). I am available to play at weddings, parties, festivals, restaurants, and cafes. Michael is extremely talented. His performance at our wedding was perfect. He arrived early and was able to setup in plenty of time. All in all, he did a great job! A great deal of planning went into my Opening Celebration and Matthew was an excellent choice. His contribution to the ambiance and feel of the event was amazing. He played for two hours straight and interacted flawlessly with the participants. I will keep Matthew in mind for future events and recommend him highly. Matthew was timely, professional and pleasant to deal with. He is a talented performer and really added a spark of magic to our event. Loved the music! If you are looking for a classical guitarist I would highly recommend Matthew Ocone. 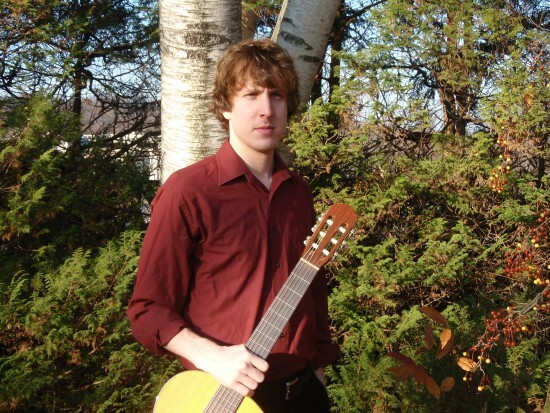 Matthew Ocone is a classical guitarist living in the Ithaca NY region. He is a graduate from The Eastman School of Music, where he earned a B.M. with Distinction while studying with Nicholas Goluses. He has also played in masterclasses for Paul O'dette, Manuel Barrueco, William Kanengiser, Jason Vieaux, and Martha Masters. Matthew's repertoire ranges from baroque guitar transcriptions to twentieth century masterpieces. In addition to classical guitar music he also plays Brazilian popular music in the virtuoso tradition of Garoto, and Dilermando Reis. Matthew has experience playing at many kinds of events, ranging from fundraisers, to weddings, to outdoor festivals. His wide repertoire allows him to match his performance to the ambiance of any venue and audience. I can provide all my own equipment for amplification at any event.